I’ve been attempting to get vCAC to consume vCNS in our lab for the last few nights. It seemed like a good topic for a blog post, and it is – just not in the way I expected. Not the most enlightening message, so I headed over to vShield Manager to see what it’s interface could tell me. core-services:1100:OVF Manager internal error. 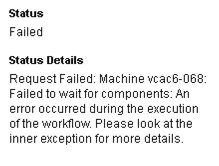 For more details, refer to the rootCauseString or the VC logs:Operation failed in VC. Type of ManagedObjectReference was not correct. For once Google was singularly unhelpful, however I did manage to find an internal document referencing some issues when vCD passed a Datastore Cluster parameter to the vShield Manager. Wouldn’t you know it, I was using datastore clusters in order to allow Storage DRS to intelligently place my VMs. Could it be? I changed my reservation to use the two underlying datastores in the above datastore cluster, and attempted to provision again. Result? Successful provisioning of my Edge.